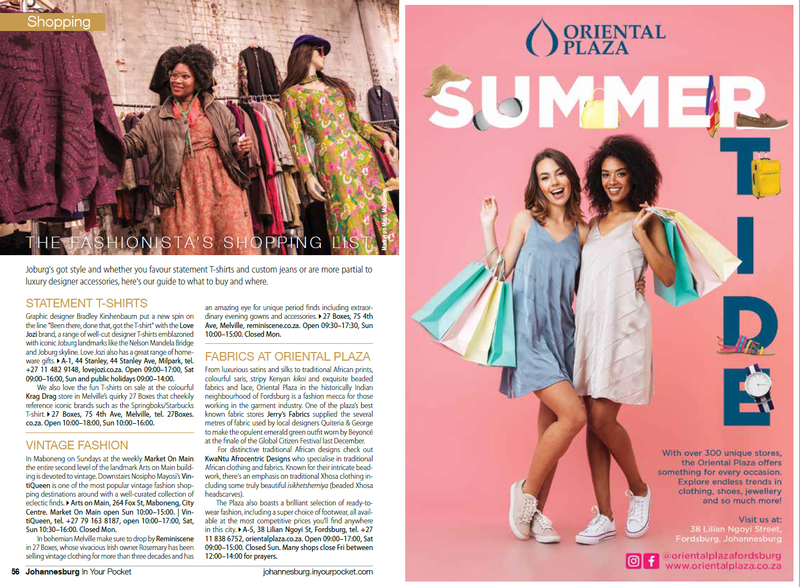 › Download your free copy of our latest print magazine! Johannesburg In Your Pocket celebrates its fifth birthday with this, our 16th issue. 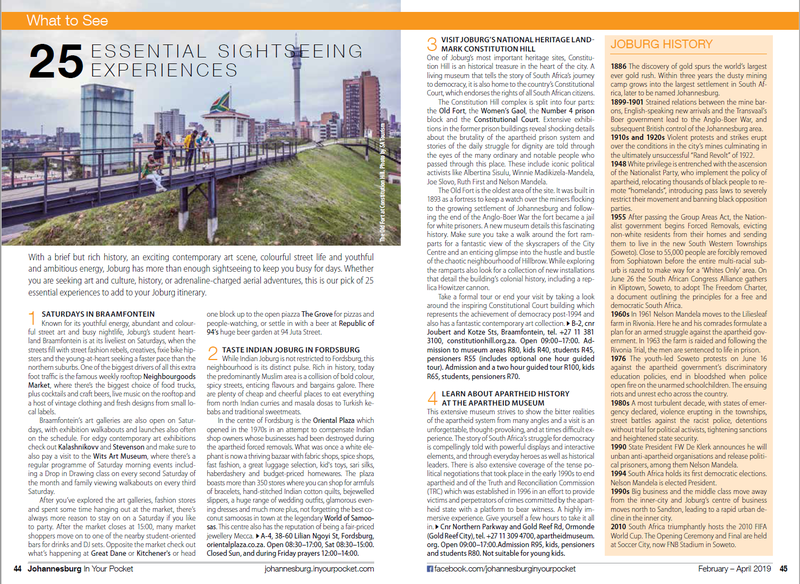 Much has changed since we first set out to give Africa’s most visited city a much-needed insider’s guide. Sandton's transformed cityscape now offers an infinitely more interesting restaurant scene than the one we used to consciously avoid, esteemed publications from Forbes to Vogue agree that the downtown districts of Maboneng and Braamfontein are among the world's coolest neighbourhoods, cyclists are taking to the city's streets and Joburg is indisputably an art capital. Stick with us if you want to know what makes this one of Africa's most culturally exciting destinations. Here's a sneak peek at our latest print magazine. For the full picture download your free pdf copy of our 68-page February – April issue here! 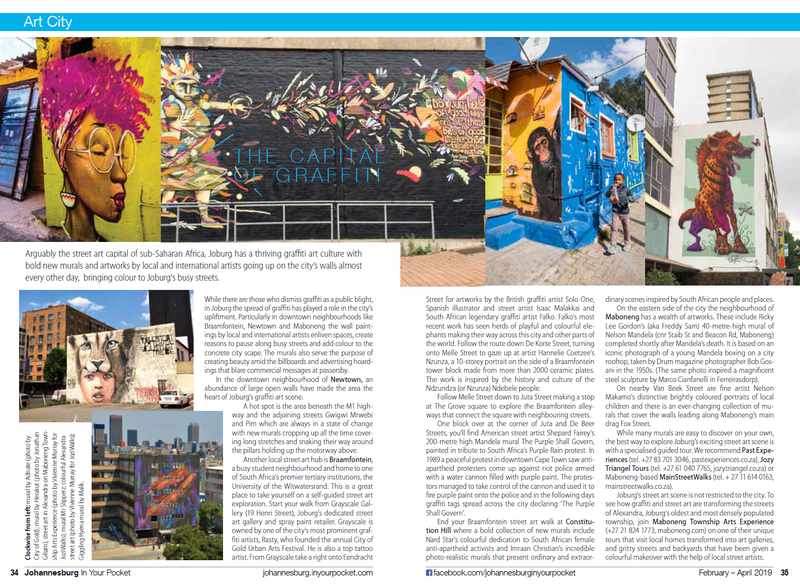 Joburg’s thriving graffiti scene has seen artists taking over the walls of everywhere from Soweto to the northern suburbs. Discover graffiti hotspots and take yourself on a graffiti walk or book a graffiti tour. 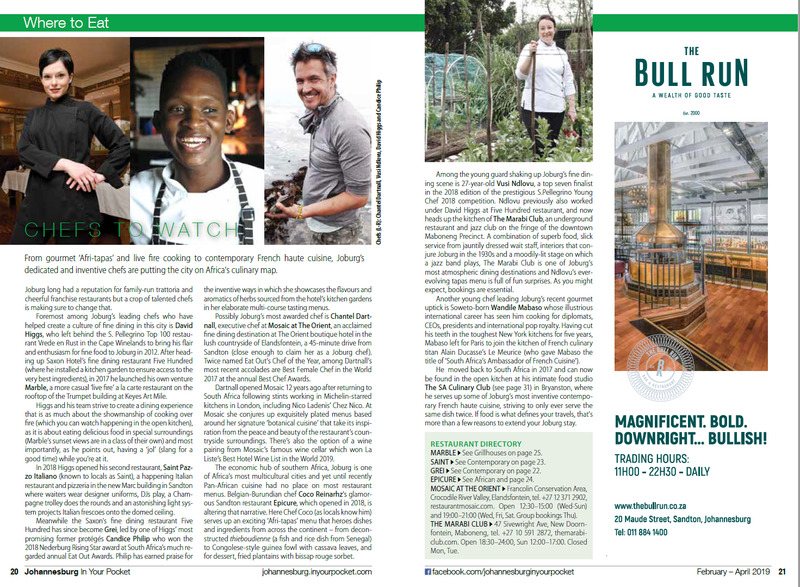 In this issue, we bring you the lowdown on Joburg’s leading chefs, and where to enjoy their food in the city. 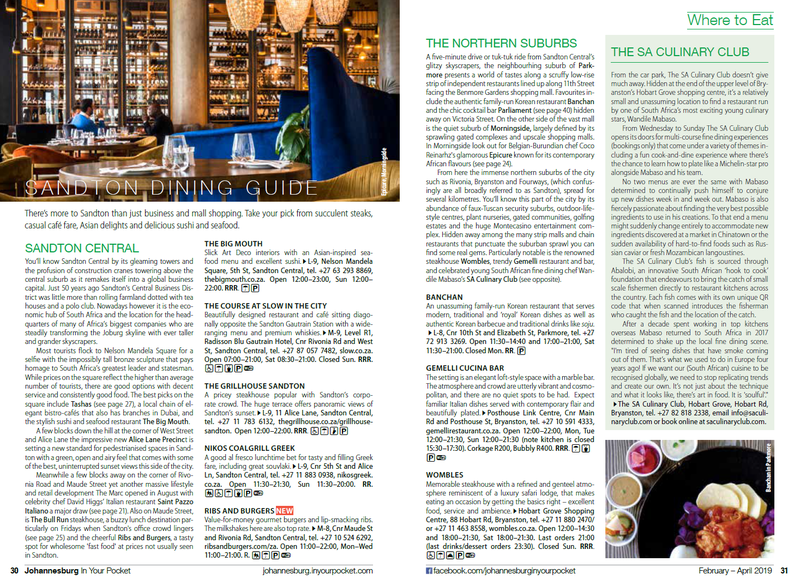 From Bryanston's best steaks and a family-run Korean restaurant in Parkmore to value-for-money gourmet burgers and the best sushi in Sandton Central, we’ve got the scoop on the best places to eat out in Sandton. 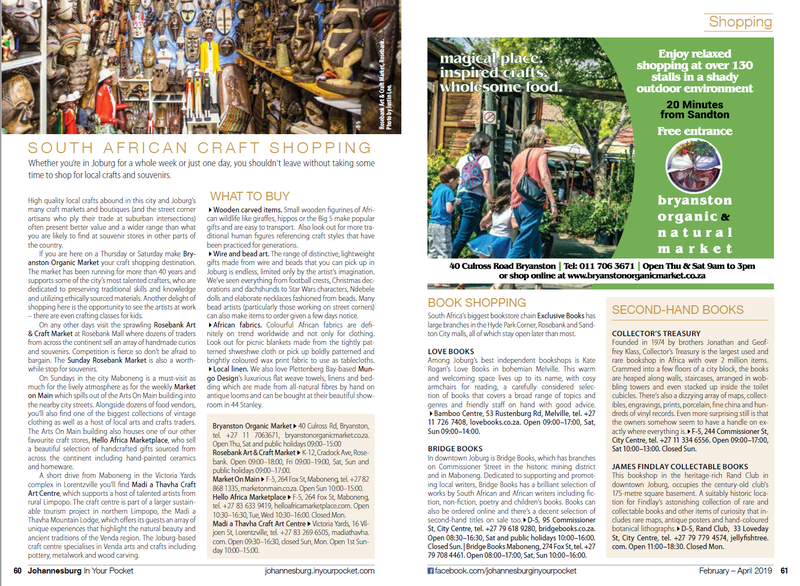 Become your own tour guide with our bumper line-up of 25 things every Joburg visitor should see and experience. 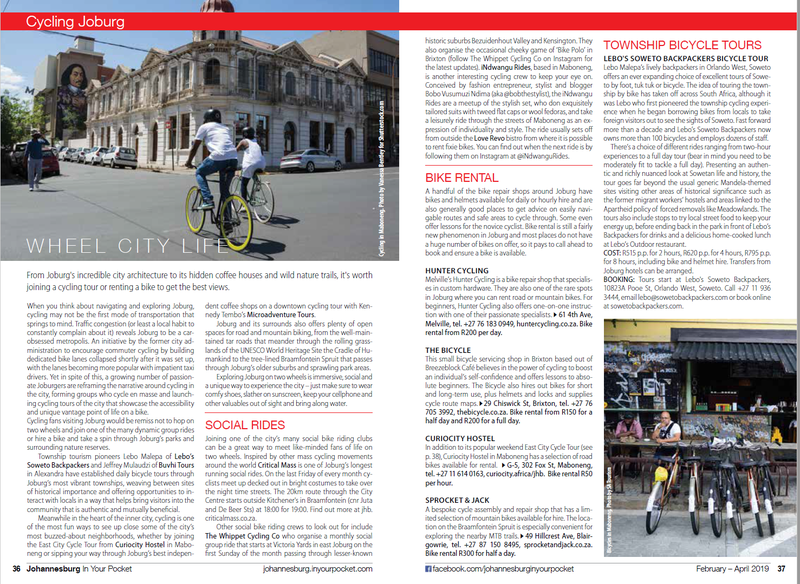 While cycling might not be the first thing that springs to mind when one thinks about getting around Joburg, the city boasts a growing cycling culture with plenty of social rides and guided tours to choose from. We looked at some of the best. 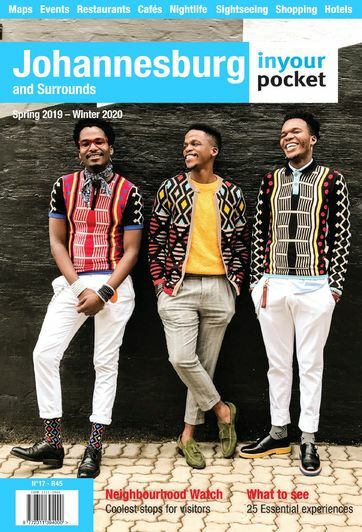 With celebrities such as Beyoncé and Pharrell turning their fashion gaze towards South Africa, Joburg style is quickly being put on the global map. From vintage steals to luxury handbags, here’s our guide to shopping like a Joburg fashionista. Ditch the conventional curio picked up from the airport on your way out, if you’re looking for handcrafted gifts that simply smack of Joburg, we’ve got some suggestions.